This thing sounds completely mental. It just explains nothing. Confusion through obfuscation. There are a couple of vids on YouTube that explain the mechanics without spoiling anything. Well played game. I’m not even mad. 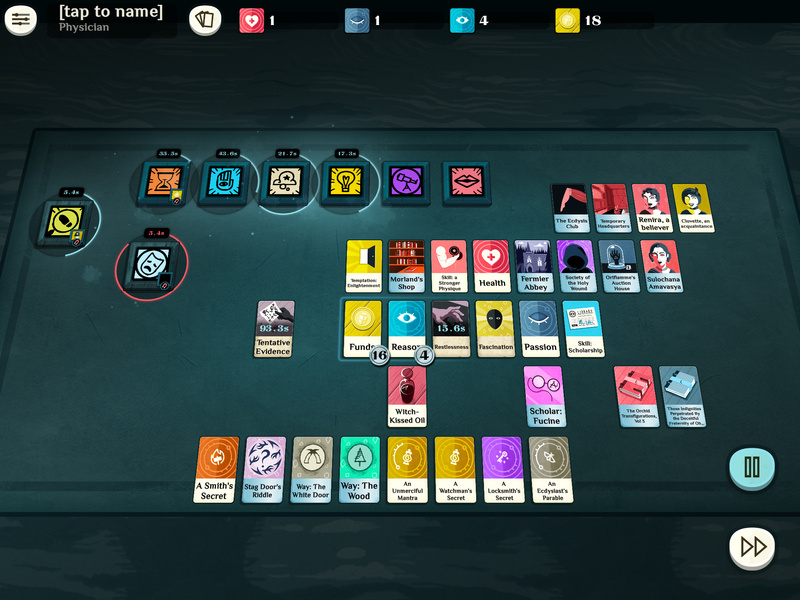 Cultist simulator (despite the lame name) is one of the best and most original games I played in recent years. It really clicked with me. Besides Elder Sign Omens (a completely different game) it’s also the best Lovecraftian game I ever played. Everything in the game, from the cards, to the sounds, to the music, to the vagueness of the initial playthroughs set perfectly the mood of a early 900 foggy London or Boston. Yesterday I almost won (or so I think, I was SO CLOSE), the play through lasted 30-40 mins. I started razor focused on some key elements I knew from previous playthroughs would get me on ‘something’ while building up stats and getting all sort of items meanwhile. Felt like an RPG. Almost no verb was left alone, timers always active (you lately discover, or so I think…never won mind you, it’s way easier to build up in early stages than in late ones). To people interested in the game, don’t get discouraged by the ‘game tells you nothing’ comments. After 3-4 deaths (a matter of 1-2 hours, maybe less) the mechanics are pretty evident and the game DOES explain things in the descriptions and in the card icons. Yes…it doesn’t tell you precisely: You need this to do that etc… but that’s part of the game. I’m the ‘You find a magical sword that seems to do something’ more than ‘You find a +4 magical sword that gives +8 only against goblins at full moon’ type of gamer, so YMMV. In the early phases there isn’t instant death so the game lets you experiment a bit, and find what does what.I don’t have great memory but if I managed to understand how to build up health, passion, reason, or complete rites…everyone can do it. After the initial phase, and after some events happen, the narrative really takes the stage, and it’s pretty glorious. USE PAUSE. I can’t believe people don’t do this. It’s the first button I pressed to read all the cards. I always play on pause, ALWAYS. When you open a verb and click on the empty card…ALL POSSIBILE USEFUL CARDS IN YOUR HAND HAVE A SPARKLING GRAPHICAL EFFECT. This saves you a lot of time trying. Some cards (later on) sparks but you can’t ‘start’ the verb…I think because I already used them to their fullest or I miss some key lore. READ THE CARDS, especially the new ones you produce after a bit of experimenting. Generally when you put them on verbs (before pressing start) they describe what they will do, and which items you’ll eventually need to fully exploit them (warning, if you miss the required items, the verb could be stuck for a while so you will loose time). Follow your character inclinations. Persist in exploring your char peculiar characteristics…if you are ‘living’ as painter…go on in that. If you live as an accountant, go on. The game offers tons of possibilities, always, but I found that developing a jack of all trades ins’t always a plus (or maybe it’s just why I never won yet)…keeping focused on just one lore, just one cult, just one type of behavior pays off…or at the very least lets you advance quicker to later parts of the game…getting you intrigued even more. The first time I got in the…how to say…the second part of the game it was by chance and after maybe an hour. I can now reach that part in less than 20 minutes. The better you get at the game, the faster you reach pivotal points (a great compliment for a game like this, too many nice games/roguelikes became too boring having you repeating initial parts over and over). Just my two cents…back dying. If you’re feeling like you’re stuck on a hamster wheel, you need to experiment. Looking stuff up undermines the design. I ran into the same issues playing on PC. I’ve found the mobile version helps me maintain continuity because I play more often. The UI isn’t ideal on a phone, but it’s definitely usable. I just pause more often than I might otherwise to look at a bunch of different cards before making a move. Just scored my very first (minor) victory. I feel like a little Cthulhu. I had a technically super successful start with loads of money, health, books, lore, skills, and yet terrible luck actually starting a cult. Absolutely swimming in resources and yet barely able to get off the ground. I just did my most succeful unsuccessful run. Tried THREE times to pass the Stag Door but couldn’t find the right answer to the riddle, despite 3 successful expeditions and many injuries and dead cultists. Tried even to cross the Woods but lost my sanity there. I was trying to recover and find the answer to the riddle in an ancient monks monastery, but apparently killing everyone there wasn’t good with the Bureau. Still, I learned SO MUCH in this run it’s ridiculous. Huge flight tomorrow, and thanks to you yahoos I bought this. Hope the plane has charging ports. This game is the is the reason I own a power bank. It took me about 5 tries and about 13 hours to unravel the puzzle that is this game. Ive not quite finished a good victory but it seems pretty inevitable. I’m not sure how much replayability I’ll get now I’ve solved the mystery that is the mechanics of this game, even though I know there’s more to see. I may well give it another run or 2 to see if my efficiency improves, or if there’s any more twists it might have in store for me. I’ve thoroughly enjoyed being lost in this world. I’m in the middle of a FANTASTIC run. Always wondered what special items were for, besides being able to sell them for funds or for some special events…NOW I KNOW, and the game just became (if possibile) even better.